WHO IS IS OPEN TO? Youth rugby registration is open to children starting at the age of 4, girls and boys can join our clubs where they will be introduced to the sport in a safe, fun and structured environment. By going through and completing the On-Line registration process. Our membership is valid for one Rugby Playing season only – June through to May and must be renewed for subsequent years. The 2018-19 season will start in July 2018 and will run through to the end of June 2019. 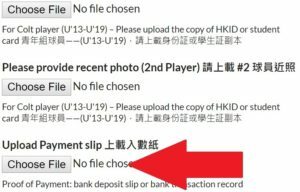 The online form will ask for a payment copy for tracking purposes, so if you are paying by mobile banking , e-transfer, ATM, direct transfer…etc. Please get that ready to enter. Please transfer the payment to Hang Seng Bank A/C: 373-065994-001 (A/C Name: ABERDEEN DOLPHIN MINI RUGBY CLUB ). >>>To confirm the payment, please upload the copy of bank-in slip (ATM) / confirmation page (by Internet Banking or Mobile Banking) to “Upload Payment slip” during the registration process. Please make your e-Cheque payable to “ABERDEEN DOLPHIN MINI RUGBY CLUB” and upload the e-Cheque file to the “Upload Payment slip” during the registration process. The relevant information will be announced in due course.